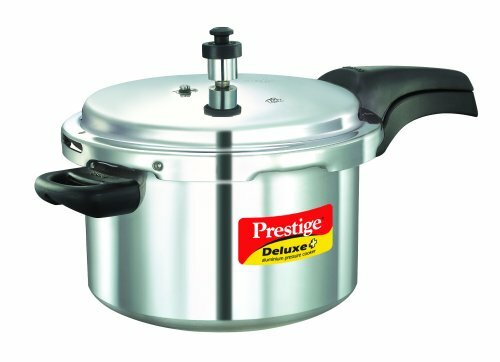 Prestige Deluxe Plus aluminum Pressure Cooker: It comes with Induction base which makes it the most versatile pressure cooker available. It can work on any heat source and enables you to cook delicious dishes in a smart way at the highest of safety through its Pressure Indicator which rises above the lid under pressure and drops when the pressure inside falls to zero, giving a visible indication to safely open the cooker. Helps you cook Faster. It has a Shiny finish. It features an automatic locking system. The overall look of the cooker is pleasing and attractive. Suitable for hob types electric, gas, ceramic, halogen and solid hot plates. Durable and handy. A strong and easy-grip handle. Faster cooking locks in vitamins. A great and must-have cookware for your kitchen. Great for cooking good, healthy food. A great and must-have cookware for your kitchen. It is a light weight cooker. Due to the use of Aluminum, the cooker is easy and light to use and store.